A recent piece in Xinhua posits that a two-party state would have crippled China’s development. With China’s National Party Congress holding its annual session in Beijing, Xinhua was inspired to run a piece lauding how China’s “unique model of governance has transformed the ancient middle kingdom into the world’s second largest economy.” Such pieces are not uncommon in China’s state media, but this piece adopted an interesting angle: it asked how things might have played out if China had instead adopted a bipartisan system, like the U.S. model. Unsurprisingly, Xinhua concludes that such a system (though “not inherently problematic”) “would have been incompatible to a country where efficiency has driven remarkable economic growth and social development.” In particular, Xinhua argues that the lobbying and “seemingly endless political bickering inherent in the Western model” would have prevented China’s government from carrying out necessary reforms. The piece highlights a number of areas where progress would have been “out of the question” if interest groups and inter-party bickering ruled the day: China’s November 2014 commitment to reduce carbon emissions, massive poverty reduction over the past 30 years, and a rapidly growing GDP. In its hypothetical, Xinhua warned that a bipartisan China “at best … would have been another India.” In a worse scenario, the piece points to the example of democracies in Africa that have been plagued by “civil wars, military junta, coup d’etats and the ‘curse of resources’ for decades.” The article also warns that a more democratic system in China could have led to fiscal instability and “an inflated military budget” for the PLA. This is the age-old defense of China’s one-party rule as the source of all positive developments in the last 60 years (with a particular focus on recent development since China’s “reform and opening up” period began in 1978). The argument is simply that Western-style multi-party democracies are inherently a bad fit for China. Such a system, the logic goes, wouldn’t allow for the political efficiency China needs to rapidly develop; worse, multi-party wrangling could foster political divisions that would tear the country apart (an appeal to the deep-seated emphasis on protecting China’s unity and sovereignty). It’s essentially the same pro-efficiency argument made by Eric Li in his July 2013 TED talk (an argument rebutted here by Yasheng Huang). Implicit in this argument is an assumption often made more explicitly by Chinese officials – in China’s conception of human rights, freedom and democracy come in a distant second to fulfilling basic human needs. China’s argument has long been that, by lifting people out of poverty, it is doing a greater service to human rights than could be gained by a transition to Western-style democracy. The Xinhua piece implies that people must choose between democracy or prosperity – and that China’s path of rapid development and one-party rule is automatically superior to, say, India’s democratic system and slower economic development. When the Chinese government discusses Western-style democracy, it inevitably paints a picture of the dire consequences that would result from importing this model to China. 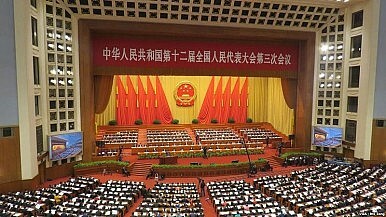 In effect, the CCP poses a choice to the Chinese people: choose democracy and China will be poor, fractured, and weak. Beijing, of course, automatically makes the choice for wealth, unity, and strength — for continued one-party rule — on behalf of its people. The narrative is littered with cautionary tales — the chaos left by the “Arab Spring”; the problems caused by Soviet collapse — without mention of successful stories of democratic transitions (including some cases that unfolded in Beijing’s backward, in South Korea and Taiwan). The Xinhua piece may be a subtle rejoinder to David Shambaugh’s recent assertion that the “endgame of Chinese communist rule has now begun.” As Chen Dingding pointed out in a rebuttal piece for The National Interest, Shambaugh is well-known in China and “Chinese scholars and officials will take his opinions seriously.” Taking Shambaugh’s argument seriously necessitates a response; in this case, returning to the old argument that democracy and rapid economic growth are incompatible (at least in China). China’s leaders insist their system won’t collapse for the simple reason that it is the only possible system for China. As Chen explains in his piece, in China “democracy is seen as a means, rather than as an end.” Thus the CCP’s insistence that democracy is an ineffective means of solving China’s problems (despite Western insistence that a free press and a system of checks and balances are essential for improving some of China’s governance issues). In the Xinhua argument, there’s no value placed on democracy in and of itself — a far cry from West, where democracy is seen as inherently valuable (and thus worth a sacrifice in terms of political efficiency). Envious Americans (such as New York Times columnist Thomas Friedman) might express wistful admiration of Beijing’s ability to ‘get things done,’ but if push came to shove few (if any) would actually choose to trade U.S. democracy for CCP rule. What Do China’s Democratic Parties Actually Do? The CCP is not China's only political party. Here's a closer look at the role and function of the other eight.